Grandma’s Home Day Care is owned by Paula O’Dume, an experienced childcare provider who holds herself to very high standards of care. Her goal is to treat the children in her care like her own family. Ms. O’Dume understands the importance of breastfeeding and the support mothers and families need. She believes, “The benefits of breastfeeding are tremendous to the baby. Breast milk is the most important things for a baby’s development.” Ms. O’Dume reported that participating in the BFSD program is one of the most important things you can do for the children in your care, and that the provision of resources given by BFSD were extremely helpful. 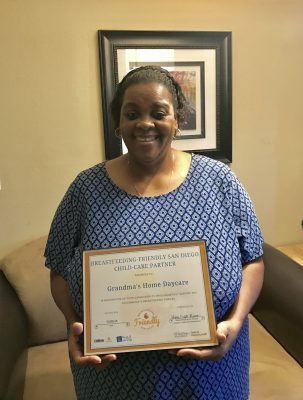 Congratulations Grandma’s Home Day Care on becoming a recognized Breastfeeding-Friendly San Diego partner!